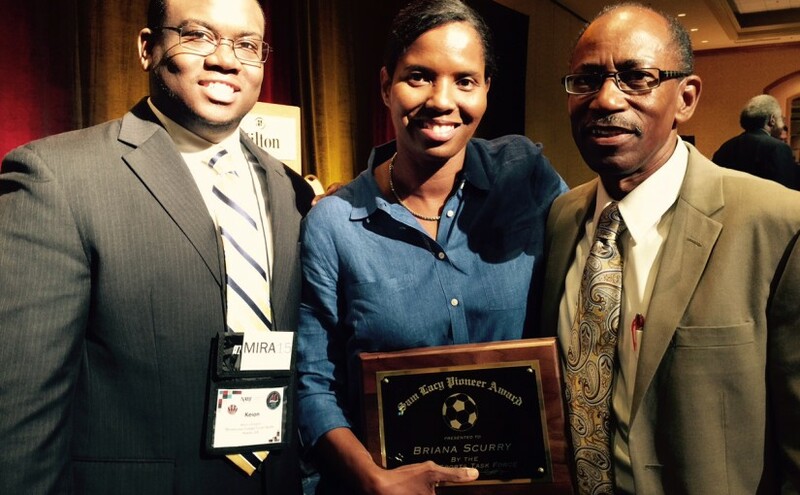 Image caption: Briana Scurry, the goalkeeper on championship Women’s World Cup and Olympic teams, celebrated receiving her Pioneer Award with Morehouse student Keion Grissom and co-host Ron Thomas on August 7 at the 2015 National Association of Black Journalists Convention in Minneapolis. The pitch has been Briana Scurry’s home since she started playing soccer on a boys’ team because there was no girls team. She was 12 in Dayton, Minnesota, and the coach made her goaltender to keep her out of harm’s way. Wrong concept. Her daring led Briana to become the most successful African-American soccer player in history and to be named on U.S. Women’s Soccer’s all-time best team after participating in 133 victories (including 71 shutouts), only 12 losses and 14 ties. She also made social history in 1999 when Briana became one of the first high-profile athletes to come out publicly as a gay person. You don’t remember that? There’s a reason why. Fact is, Briana has never hidden being gay and speaks out frequently on diversity and LGBT issues. Her career ended in 2010 when an opponent accidentally kneed her in the side of the head. She completed the first half of the game, walked to the bench leaning to one side, and never played again. Her life was put back on track after neurologist Kevin Crutchfield figured out that a nerve that went from the spine to her neck to the back of her head had become intertwined with a muscle. A 2013 surgery removed the nerve, ended the headaches and started her path toward normalcy she’s still striving to achieve. Especially because girls playing soccer are unusually susceptible to concussions, Briana has become an outspoken advocate for concussion awareness and criticizes soccer federations that underplay the problem. Soccer needs someone to save itself from ridicule. Who could be better for that task than Briana Scurry? For all that you’ve contributed to your sport and to our enjoyment, please come get your Pioneer Award. © 2019 Ron Thomas' Take.